योग्यता की कीमत पर किसी भी प्रकार के आरक्षण को कतई उचित नहीं ठहराया जा सकता है. सिर्फ जाति या लिंग के आधार पर आरक्षण राष्ट्रीय सोच का अपमान है. आरक्षण के कारण आज देश में योग्यता अपात्रों के समक्ष नतमस्तक हो हाशिये पर चली गई है. गुंडे, मवाली जिनको शायद जेल से भी बदतर जगह होना चाहिए था वे सांसद बन देश का बंटाधार कर रहे है. ये आरक्षण उसी व्यक्ति की देन है जिसे देश अपना राष्ट्रपिता मानता है. आजादी से आज तक इस आरक्षण ने कितनी प्रतिभाओ को कुचला है, कितने योग्य लोगो को नकार कर अयोग्य व्यक्तियों को सर पर बैठाया है. नतीजा आज देश की दुर्दशा. ये जो थोड़ी बहुत चमक है वो उसी निजी या प्राइवेट क्षेत्र के कारण है जहाँ आरक्षण नाम का ये राक्षस अभी तक नहीं पहुँच पाया है. देश की दलदल राजनीति में पिछडो के आरक्षण के बाद, अति पिछडो, अति अति पिछडो महिलायों में पिछड़ी महिलये इत्यादि का आरक्षण के नाम पर वोटो का गन्दा खेल जारी रहेगा. aap avashya koi purush hain jo mahila ke naam se likh rahe hain. koi bhi stree mahilaon ke virodh me likh hi nahin sakti, jis tarah aapne likhaa hai. महिलाओं को आरक्षण देने से कुछ नहीं होने वाला, जब तक की महिलाओं के बारे में हमारे समाज की मूलभूत सोच में परिवर्तन नहीं आता. ३३ फीसदी आरक्षण का लाभ केवल नेता लोगो की बीवीयों, और माँ बहनों के आलावा किसी को नहीं मिलने वाला, ये आरक्षण तो उल्टा राजनीती में परिवारवाद को ही जन्म देगा. क्या तुम लोगो को लगता है की कोई महिला संसद बनने के बाद, महिलाओं के उत्थान के लिए वाकई ईमानदारी से काम करेगी? this comment is about your other blog i.e. posted in blogs then we have no need do go anywhere else(other job sites that have that kind of facility like www.indijobs.in). i don't want to leave your site for finding the result but i have to. plz think about this and let me know if my feedback is any importance for you. create districts on the basis of caste. For women 33 per cent reservation in Parliament and State Vidhansbayon sought after reservation in the Rajya Sabha has already started up. For women 33 per cent reservation in Parliament and State Vidhansbayon than backward, Dalits and Muslims demand reservation many teams are doing. The demand for reservation in education for Mahilayo table. The demand for reservation in government jobs for Mahilayo table. Ranganath Mishra Commission for reservation for Muslims and said all parties except the BJP is ready. Given this country's politics rooted demand will be fulfilled first. Tribe's reservation and change Jati Anusucit reservation to Muslims and Christians has been for some time sought Pcle. From time to time to give justice council reservation is being advocated. Private institutions (Praivot Sector) for reservations are being made for a long time for this government is Prytnshil. Recently, the Rajasthan High Court in the name of Young Nen panchayats withheld is a new type of reservation. After all the reservations reservations for youth, the elderly will be sought for the reservation, etc. and told myself they would be friendly. All people are affected by reservation. But the class gets it and starts to talk in favor of reservation to tell it that your rights may be considered that the reservation for some time it has to. In reality, not actually getting reservations real Jrurtmnd, are taking advantage of this same people who are already ahead. In fact, only two are held Avm poor and backward class, which privileged classes poor - bringing forward the name of backwards benefit our people are Phuncha. The fact that governments in the country think if my work well, then why did it matter that some classes have fallen behind. aparna ji is a brilliant lady with positive frame of mind.i appreciate her comment on the issue of women reservation.it is not an end of the endless problems women of our country suffering with,in fact it is the begining of a new problem.."Baat niklegi to fir dur talak jayegi"
jalde he naye post creat honge MLA pati,MP pati, minister pati etc . fayda kya hai ? pehlai mahelao ko apne power ka anubhav ho aur purusho ke gulame ke mansekta sai bahar aai! aarakshan to aana he hai par sahi artho mai aai! हमारे संविधान में लिखा है कि "किसी के साथ जाति, वंश, रंग, धर्म, जन्मस्थान व् लिंग के आधार पे कोई भेदभाव नहीं किया जायेगा" . अब ये बताओ कि क्या संविधान में वर्णित इन सभी आधारों में से क्या कोई ऐसा आधार है जिस के आधार पे भेदभाव न किया जा रहा हो? जाति, वंश, रंग, धर्म, जन्मस्थान के नाम पे तो पहले से ही भेदभाव किया जा रहा था और अब ९ मार्च २०१० से लिंग के आधार पर भी भेदभाव होने लगेगा. संविधान कि रेड़ मार के धर दी है हमारे सत्ताधारी वर्ग ने | सत्ताधारी वर्ग संविधान को अपनी सहुलियत के हिसाब से इस्तेमाल और परिभाषित करता है | जब संविधान में लिखी किसी बात को मानना ही नहीं है तो ये संविधान बनाया ही क्यों है? ऐसी - तैसी करवाने के लिए? जातियों में बाटने का काम नया नहीं है . ये काम हमारे पूर्वजो ने शुरू किया था .आज भी हमारे समाज में निचली जातियों के साथ संपन्न वर्ग बुरा बर्ताव करते है . मेरा मानना है की जबतक निचली जातियों के साथ हुयी अमानवीयता को न्याय दिलाने के लिए आरक्षण दिया जाना चाहिए ताकि वे ऊपर आ सके . और तबतक दिया जाना चाहिए जबतक की उच्च जाती के लोग निचली जातियों के हातों का पानी शहर्ष स्वीकार कर ले यानी की बड़ी जातीय छोटी जातियों से घुल मिल कर रहने लगे . जहाँ तक महिला आरक्षण का प्रश्न है भारतीय महिलाओ की उन्नति के लिए यह ठीक ठाक कदम है ठीक ठाक इसलिए क्योकि पुरुष नेता इससे अपने परिवार की महिलाओ को राजनीति में प्रवेश करने की कोशिश करेंगे जिससे जो सीट पहले उनकी हुआ करती थी अब भी उन्ही के आदेश से चलेगी और यह ही सच्चाई है. फिर भी इससे महिलाओ का विकाश तो होगा ही . अब में भावेश से प्रश्न करना चाहूँगा की सिर्फ सरकारी नौकरी या सरकारी पद ही उन्नति का प्रतिक है क्या ? प्रतिभा अपने आप ही रास्ता बना लेती है . ऐसे कई उदाहरण है. अगर आप सरकारी पद को ही सब कुछ मानते है तो नंदन निलेकनी को ही लीजिये उनकी प्रतिभा ही थी जो सरकार ने उन्हें पहचान प्राधिकरण का प्रमुख बनाया है. Manisha jee, mujhe lagata hai aapne aarakshan ke marm aur is par ki ja rahi raajniti ko kafi karib se anubhaw kiya hai. Pahle to hum hindu-muslim ke naam par tode gayee aur pakistaan ka nirmaan tak kar dala gaya, uske baad hum language ke naam to tode gaye aur ye desh kai rajyon men bat gaya fir hum GEN/SC/ST/OBC ke naam par tode gaye aur aaj hum Male/Female ke naam par tode jaa rahen hain. Ye bilkul hi sahi hai ki aarakshan kaa labh sirf aur sirf Garibon ko milana chahiye iske sath hindu-muslim-SC/ST/OBC/GEN aadi column nahin lagni chahiye. This reservation has led to many bright brains leaving India and going for better options in US, Europe..India is going down steeply.Why dont these politicians go abroad for treatment and why not get operated by a doctor made using reservation..why every one wants thier ward to study in private school..why all good services are handled by private companies..because they dont have reservation..anyway govt jobs are on decline and one day government will be dens of inefficiency corruption and nothing else..
आरक्षण केवल सामाजिक मुलो पर ध्यान रख कर देना चाहिए न की लिंग धर्म पर जैसा की संविधान में सबसे पहले दिया गया था . आपकी सोच को थोड़ा और विकसित होने की जरूरत है. मुम्बई की लोकल रेलवे में भर्ती होने वाले J.E. को 18 महीनों की शुरुआती ट्रेनिंग देने वालों में वो लोग भी होते हैं जो खुद इंजीनियरिंग डिप्लोमा नही किए होते. और वो लोग ट्रेनों को सफलतापूर्वक ऑपरेट करते हैं. गत्ते की रेलवे टिकट पर स्याही की मुहर लगाने की मशीन एक अनपढ़ आदमी ने विकसित की थी. पुराने वैद्य B.A.M.S. नही किए होते थे. अगर मध्यम दिमाग वाले छात्र को अच्छी शिक्षा और ट्रेनिंग दी जाए तो वह भी एक अच्छा प्रोफेशनल बन सकता है. सरकारी कंपनियां या विभाग भ्रस्टाचार के शिकार हैं न कि कोटे के तहत आए कर्मियों के. जब आपकी मा किसी ज़मींदार के खेत में काम करने जाती होती और पिताजी दिहाड़ी मजदूरी के लिये गलियों की खाक छानते होते तब आप अंग्रेजी में इंटरनेट पर ब्लॉग्स नही लिख पा रहे होते. कॉन्वेंट स्कूल से पढ़ाई करने और सारी सुख सुविधाएं मिलने के बाद आपकी सोच इस तरह की होना स्वाभाविक है. आप देश के वास्तविक चेहरे से वाकिफ नही हैं. बस एक बात का जबाब दीजिये – “ क्या समाज के उस कमज़ोर, गरीब, और साधनहीन हिस्से को ऊपर उठाना हमारी जिम्मेदारी नही है? ”. आरक्षण का उद्देश्य वही है. आरक्षण सही तरीके से लागू हो और यह अपने उद्देश्य में सफल हो, ये सुनिश्चित करना हमारी देश के प्रति जिम्मेदारी है. Dear, aapke sochne ke level aur language se aisa lag rha hai ki aap jyada padhe likhe nahi hain. Aarakshan aapke raste ka roda nahi hai. Kya General category ke log aaj jobs me selection nahi pate? aarakshan 49% tak simit hai. baki 51% seats to open hoti hain unke liye. Jab aap jaise log koi exam nahi nikal pate to apni nakamyabi ko chupane ke liye sara dosh aarakshan pe madh dete hain. Ek baat ki guarantee deta hoon- agar aap 51% seats available hone per job nhi paa sakte to 100% seats available hone per bhi nhi paa sakte. Aaj ke samay me Job paane ke liye, koi entrance exam nikalne ke liye mehant ki jarurat hai jo aap jaise aaram pasand log nahi kar sakte dear. Mai jis company me kam krta hoon, usme all over india me 5 seats thi is post ke liye. General-2, obc-1, sc-1, st-1. mai SC category me select hua. 9 thousands candidates ne exam diya. usme SC ke around 2700 candidates the. kya mere liye itna asan tha ek seat ko pana? competition mere liye bhi tough tha. per maine jo preparation ki, padhai ki vo mai janta hoon aur aaj uska result paa rha hoon. Meri schooling U.P. ke BulandShahr district ke ek gaon me primary school me hui. Rat ko mitti ke tel ke deepak se padhta tha garmi, sardi, barsat me. 6th-10th class tak gaon se 5 km door paidal jata tha. Mere gaon ke General category ke kuchh dost bhi the jo aaj acchi posts per hain. unhone Reservation ko kabhi dosh nhi diya, balki padhai ki mehnat se. ye reservation ka topic us rubber ki tarah hain jise jitna khicho ge utna hi lamba hoga. hur insan ka nature hai ki vo pehele apne baarey mein sochta hai aur phir doosron k barey mein. agar app reserve category se is topic par baat karo ge to vo kahe ge hume reservation chaiye aur agar unreserve category se baat karo ge to bolegein equal oppurtunity should be their for all. ye castism na kabhi khatam hua hai aur na kabhi hauga. actual mein hmara system ,hmari soch hi is baat ke liye jimevaar hai. jis desh mein mumbai waley bihaar walo se nafrat karte hain wahan kya khak reservation khatam haugi. everybody in this country is dying for language, religion and colour. hum bhagwaan k liye ladai kar rahe hain katleaam kar rahein hain. kabhi bhagwaan ki jagah soch k dekho k wo khush hota hoga jab hum uske bando ko marte hain.this is not the topic of our debate par sochney wali baat hai. kya hum ye promise karte hain k reservation khatam honey par hum sc ory ko unki jaat se category se sambhodan nahi karegein. unke sath apne baccho k risthey karein ge. nahi hum kabhi kar hi nahi sakte. ye reservation khatam karna na mere hath mein hain aur na sarkar k hath mein. jab tak castism nahi kahtam hota tab tak reservation nahi khatam hogi. Mai aapki bat se kafi had tak sahmat hoon. Bahut sahi likha hai aapne. April 26, and May 4 ke comments mere hi hain. Main manta hoon ki Jaativad khatm karna mushkil hai, even na mumkin bhi. Magar Reservation ka uddeshya ye nhi hai. Jaante hain- SC/ST category ke sirf 9% log hi business kar rhe hain (as per a report in TOI), karib itne % hi Jobs me hain, Aur jamindar to bahut hi kum hain. Is tarah SC/ST Category ke karib 78-80% log apni jeevika chalane ke liye bade jamindaro, saahukaro aur baniyo per nirbhar hain. Aur in bade logon dwara hi unka samajik, sharirik, mansik aur aarthik shoshan hota hai. General category ke logon per SC/ST ke logon ki nirbharta kam krne ke liye, unhe aatm-nirbhar banane ke liye hi Aarakshan laya gaya tha. Aakhir kyon delhi, mumbai, kolkata jaise desh ke bade shehro me mehnat-mazdoori karne jaane vale logo me more than 90% SC/ST and OBC category ke log hote hain. Aur vo bahar khud ko General category ka show karte hain, otherwise unhe vahan bhi kaam nhi milega. Mai gaon se hoon. vahan ke khatarnak halat janta hoon. Isiliye mai reservation ko support karta hoon.aaj mai achhi job karta hoon. apne bachho ko resources ki kami nhi hone dunga. mai vada karta hoon ki unke liye kabhi reservation ka fayda nhi lunga. open category me compete karenge vo. reservation usko milna chahiye jisko iski jarurat hai. In country like India no political party have power to oppose reservation ,just because of vote bank. Every one who is not taking the benefit of reservation always oppose reservation and similarly those who are taking the benefit of reservation always support it . We(common man) cant do anything in that . Just prepare your self for private sector and pray to god that ,"prevent private sector to implement reservation". This is only the vote politices. Reservation ko India me bahut galat use kiya ja raha hai. Kisi or Countrey me aisa kuch nahi hai. ye India ke Politices hai sirf Politices. Aap ek Baat batiye USA jaisi Contrey me Ladies ka Reservation nahi hai aap log ladies ka Reservation kyon kar rahe hai. Yahah Ladies ko Panchyati Raj 50% reservation de to diya gaya but kya ye Justfiey hai. Waha Sirf Ladies Sighing Authorties hai. Esse Reservation dene se kuch nahi hoga, aap unke base ko Improve kare, Education se Purane Riji rewajo ko Khatam karke, Ladies apne aap aage aa jayegi. That was one point. Now 2nd point for Castism Reservation. Kya SC, ST ko reservation dene se wo caste sudhar jayegi, nahi ussse ek pariwar to sudhar sakta hai lekin puri Caste nahi. 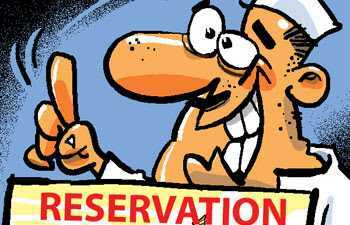 This type of reservation is based on only and only Finincial situatons not on caste bases. Aap ek baat bataye ki jo Student ko aap reserve cat. ka bol kar professional courses or kisi Class me addmission de dete hai chahe wo Acdemic me 0 ho, aap Es parkar se un logo ki upexa kar rahe hai jo General Caste se belong karte hai or Fincial Position strong na hone ke karan piche rah jate hai, aap fees me relax dejiye jo poor hai unko. Castism reservation se kuch nahi hota. Please en baato ko dhyan me rakhkar eska parchar kiya jaye taki reservation ho to only poor logo ke , wo bhi sirf fincial assistant ke tor par na ki aap usse back door entry karwae. Jo reservation ka kaam suru hua tha wo esse liye suru hua tha but India me to bahut bura ho raha hai jo ek din es Country ke liye bahut bura hoga. not even today SC/ST are given equal respect and importance, they r bound to hide there caste otherwise they wont get jobs as they get and would hve to face discrimination at there work plac,ADD THIS IS TRUE WE CANOT DENY THIS.reservation was given to support living standard of those people those who where suppressed by high caste people. reservation is given according to the number of total population of that bacjground means,there are total 7% ST,total 16% SC 27% OBC and rest is allotted to generals according there population. the ony DRAWBACK of reservation is that when SC/ST perform better the general in any exam that particular candidate of SC/ST catogery get place in general cota, means if there r 25 seats 4r generals a good performer of SC/ST can get place in that 25 seats,that is painful and main conflict of reservation. let me tell u some thing sad taht around 4000 SC people near unaao KANPUR converted in other religeon because of pain of being considered as lowcaste,now those converted peolpe are OBC according to constitution and getting same respect like others. there is a church in ALLAHABAD whose main aim is to convert low caste people and people get converted easily, and there is strong reason bahid that when u r hungry there is no religion dear ther is only one religion TO FEED UR STOMACH AND UR FAMILY STOMACH. a SC/ ST guy cannot marry a general girl, he will have to DIE 4r his dids. those people who has written there comment here wont allow his/her family member to marry SC/ST. i am a person from sc category.today i am doing mba just bcoz govt.paid my fees, in my colllege there are 7 people from management quota and all are from open category. Yeah! I almost agree with you. You have a good understanding of need of reservation. Making SC/ST independent and financially capable of earning their livelihood is the aim of reservation. A country is defined by the people living on its land and native to it. If a major part of India is jobless, hungry, penniless, resourceless and incapable of living their lives with respect and standards then how can we say India is soon going to be listed as a developed country? We talk of 21st century, we talk of globalisation...but we dont see behind there are crores of people who are dying of hunger. Can we say we love our country? Another point, you said that most painful thing for general castes is that an SC/ST candidate can get place in open category reducing the chances of selection for them. But, if unreserved 51% seats are only meant for General castes, then it will become a reservation for them too. Every category's candidate will get selected against the seats reserved for his/her category, and then General castes candidates will get largest fraction of quota which will be 51%. 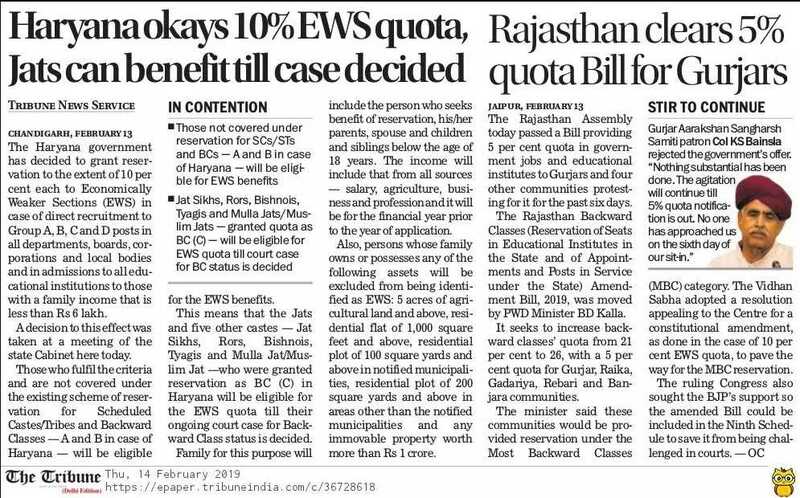 It will totally reverse the meaning of quota. Quota is for those candidates who cant fight for open seats as they coudnt somehow score high in their studies facing financial, social, physical or racial problems. A physically handicapped is given reservation irrespective of his/her category. SC/ST candidates are socially and financially handicapped. 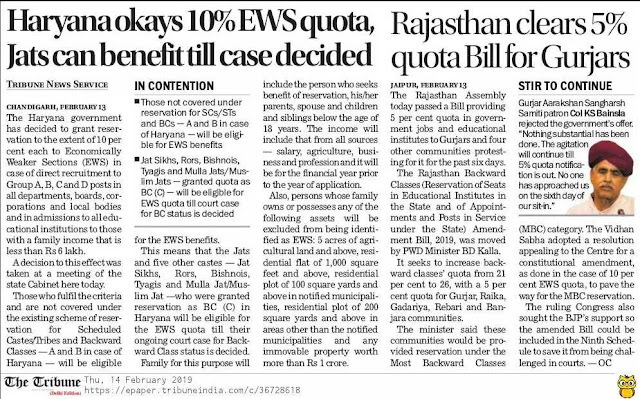 They have right to claim reservation. Dost, kash her koi tumhare jaisa soche. Jab sabhi SC/ST financially capable ho jaenge, castism lagbhag khatm ho jayega kyonki SC/ST ki General per nirbharta nhi rah jayegi. Jo sulook angrejo ne indians ke sath kiya, wohi Zamindar, sahookar log ab desh azad ho jane ke bad SC/ST ke sath kar rahe hain. SC/ST kab azad honge? Naxalvadi kyon paida hue? Vo log hain kon? unhe naxla banaya kisne? if god made man diffrerent and not reserved then country law reservation why ????????????? cobler,cleaners,washersmen so on where called chamar,dhobi etc right. yaar 60 saal ki tumari life hai sari. pta nai usmey bhi tumney pehle mar jana hai ya nahi. is liye tention mat lo or apna apna kam karo. reservation to hona hi chahiye kyoki 500 salon se barhman,vasaye aur chatriyon ne dalit samaj ka soshan kiya hai, dalit samaj ke logo ko mandir jana mana tha aur unke pad chinho ko mitne ke liye unke piche chadon bandha jata tha unko hamsa ganda kam diya jata tha jaise chamda niklana safai karna etc. dalit logo ko shiksha ka adikar nahi tha agar aisa koi karta to uske hath kat diye jate ankh fod di jati. choachot(untachabality)ki partha thi agar aaj bhi aap gaon dehat me jate ho to waha abhi bhi ye partha hai jaw 560 salo se ye partha nahi badali to log reservation hatne ki baat kyo karte ager dalit se ye adhikar chin liya to wo time aane me der nahi lage jab fir se dalit ki piche chado aur gernal catagory ke log fir se in ka soshan karnge. angrejo time me genral class kawal angrejo ki gulam thi jab ki dalit dono ke gulam the. rahi baat netao ki wo to suro se hi jab kisi ke ke upar aati hai wo apne liye karata hai chahe wo jhasi ki rani ho ya mughal badasha ho ya gandhi ji ho job in logo ke opar aaya tab ye desh ka naam le kar log le chle. jab jashi ki rani se jhashi chine tab wo angrejo khilaf ho gaye aisa hi mughal baadsha auranghjeb ke sath hua. gandhi ko jab first class ke dabe se feka tab un ne ajabi ki maang ki. kyonki unhe laga ki unke bhedbhav hua hai. "why reservation is necessary if you are eligible one for the job; if you are not eligible for the job why do you want job." mind it reservation should not be considred ad a tool to get the job but it should be seen as a measure to uplift the discriminated and underfacilitated ones. Beete waqt mei kisne kiske sath jo bhi kiya .... ismei us insaan ka kya dosh kisi is aarakshan ki wajah se naukri nahi milti jab ki us mei pribha ki kami nahi hai.....sirf is liye ki wo general se hai. aaj kaun sa aisa sthan hai jahan use ST ya SC se zyada mil raha hai ....??? Angrezo ne hmare upar 200 saal raj kiya to kya ab hum bhi un par raaj karne ke liye duniya se aarakshan magte phire. Oh Geetika! You and your anonymous both have a feeling of jealousy and nothing. You must be a failed person. Aaj bhi jyadatar exams me General candidates top karte hain. Then why cant you? Your knowledge seems to be purely bookish. If you were familiar with statistics of economic status of SC/STs you would definitely not go against reservation. Jin logon ne November 1949 me constitution pass hone ke waqt parliament me iska wirodh nahi kiya, vo bhi General ke hi the aur aapse jyada padhe likhe aur samajhdar the.